Bridgton Sports Camp director Brian Kooperman starts off every morning the same way, and today was no different. He woke up, went for his run and then hit the office to get some work done before the mayhem begins. At exactly 7:15am, the division leaders came into Koop’s office for their daily meeting. They recap the previous night and discuss what will be happening for the day. 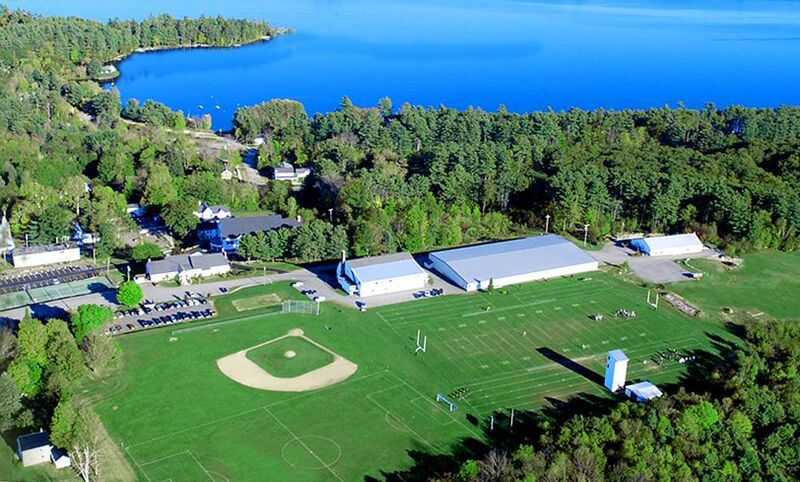 No matter what, once 7:45 hits, the whistle is blown and the campers are getting up and making their way to breakfast. As usual the rookies are up and ready to go, eager to get to the dining hall first. The professionals are ready, but they’re moving at a much slower pace. The seniors do not care about eating first. They very slowly, with counselors assistance of course, make their way out of their bed and up to breakfast. The room was pretty quiet this morning as everyone was enjoying eating french toast and watching the morning Sportscenter. It was a beautiful morning. The waterfront was clicking on all cylinders and majors and minors were moving at their usual fast pace. 4 days into camp, and the schedule is now routine. Counselors were doing an amazing job running their activities and making sure campers were where they needed to be at the proper times. Ice Hockey is one of our most popular major periods. The program is led by Bridgton Academy’s head coach, Mike Warde who runs an incredible program here at camp. Today’s period started off with a warm up where players circled Coach Warde and skated forwards and backwards at different speeds. The players then put their skills to the test with stick handling circuit training, quick transitioning, and finally moving into a 3-on-3 scrimmage. Unfortunately, the sun can’t always shine all day, and after lunch the rain came and forced a little schedule change. Ice Hockey campers got to play, while the rest of us had to move to some indoor activities. For 90 minutes, rookies and professionals went and played jeopardy and other fun board games, and seniors had an indoor handball tournament. After the ice hockey period was done, the entire camp had the opportunity to enjoy a free skate. 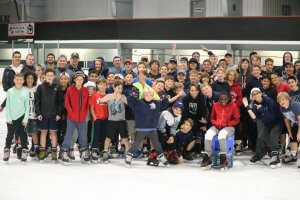 Campers and counselors hit the ice. It was awesome being able to see some kids get up on skates for the first time! It was a fun experience for everyone who attended and hopefully we’ll have the opportunity to do it again. Dinner was a cookout special with the classic hamburgers and hot dogs. After dinner, the rain stopped and we had our 3rd night of Bridgton Sports League (BSL). Games of kickball, handball, volleyball and cricket were competitive and fun. When the games ended, the rookies went back to their dorms to shower and get ready for bed while the professionals and seniors enjoyed some free play and got to hangout in the wolverine den before it was their time to head back to the dorms. It was another great day of camp, and as always, we cannot wait until we get to do it all over again tomorrow.